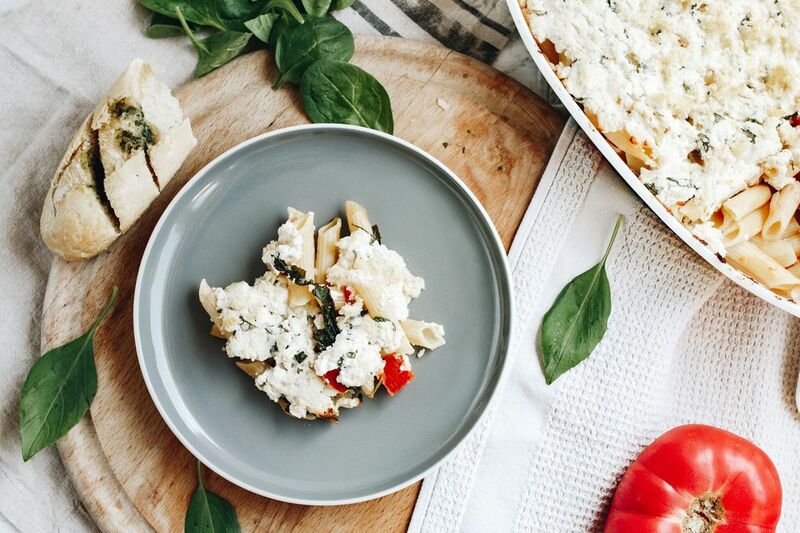 When you have a taste for cheese-stuffed shells but not the time or the inclination to make them, this vegetarian baked pasta with cheese and spinach recipe is the perfect stand-in. Is there anything more comforting than a cheesy, hot, baked pasta casserole? And the best part of all is you don't have to add meat to create this dish that is nourishing, satisfying and enjoyable for the whole family. It's the perfect vegetarian dinner idea. Made with Parmesan and ricotta cheeses, spinach, tomatoes, and basil, it's healthy enough for adults to give their nod of approval yet cheesy enough for kids to ask for seconds. This is a great everyday dish that can be elevated to a company-worthy meal when you serve it with a green salad, garlic bread, vino, and candles. Best of all, it can be assembled in advance and popped in the oven when you are ready to eat. And if the news couldn't get any better, on average, it takes only about 10 minutes to prepare and 30 minutes to cook! Heat oven to 350 F and lightly grease a 13-by-9-inch casserole dish. Cook pasta in lightly salted water according to package directions - about 10 minutes. Drain well. Combine fresh chopped basil, Parmesan cheese, and minced garlic with 1 teaspoon olive oil to moisten the mixture. Stir in ricotta cheese and set aside. In a large skillet, sauté onions in 1 tablespoon olive oil over medium heat for 5 minutes or until translucent. Reduce heat to medium-low and stir in balsamic vinegar, tomatoes, and salt and pepper to heat. Cook for another 3 to 4 minutes. In a large bowl, combine cooked pasta with spinach and tomato-onion mixture. Transfer to prepared casserole dish and spoon ricotta mixture on top and spread into an even layer. Evenly sprinkle breadcrumbs on top then drizzle with 1 tablespoon of olive oil. Bake for 25 to 30 minutes, until lightly bubbling. Let cool slightly before cutting into squares. For a complete meal, add a side green salad and perhaps some toasty garlic bread. To prepare this dish in advance, assemble it, cover, and refrigerate until you are ready to bake it. It will take an additional 10 to 15 minutes to bake if it is right out of the refrigerator. It also freezes well after baking. Place individual portions in freezer containers for delicious hot lunches that can be rewarmed in the microwave at the office or school.